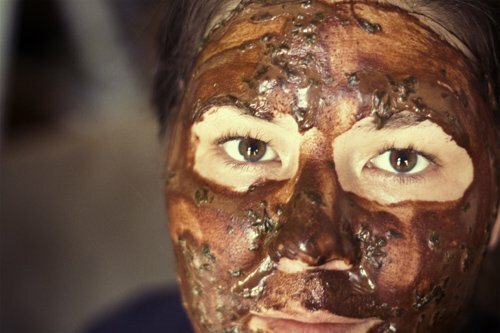 Parsley-Cocoa Facial Mask ... looks a little like pudding. You’re getting ready to shop for an awesome recipe, which just so happens to call for 2 Tbsp of parsley. You go to the store, and all you can do is buy a bunch of parsley. Like, at least 2 cups worth. Two weeks later, you open the fridge drawer and what once was parsley is now a wilted goop clinging lifelessly to the bottom. It’s happened to me. Because I can never think of anything else to do with parsley. Ever. Today, I was flipping through a natural beauty book and hit upon a recipe that called for parsley. It also called for quince and chlorophyll. I do not have those things. 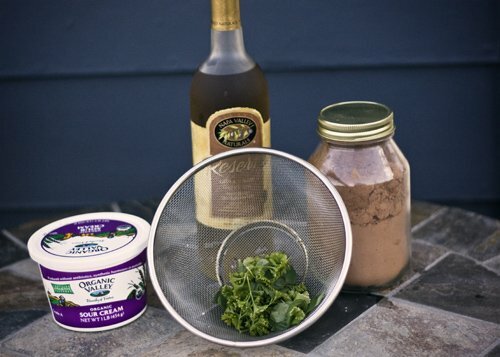 But after a bit of research that led to the discovery that parsley is excellent for your skin, I decided to whip up my own mask using things I absolutely love. Here’s the best part: Not only will you get a mask out of this, but you’ll get a small bit of parsley-infused olive oil out of it. This, you can use as an after-mask moisturizer … or you could even cook with it. It’s up to you. Nearly every natural ingredient (read: food) you can put on your face has a huge litany of benefits like vitamins, antioxidants, minerals and more. Parsley is no different. A HUGE dose of vitamin K. This most facial-licious vitamin will help reduce wrinkles, balance out skin tone, make under-eye circles less apparent, heal blemishes, and more. Myristicin. You probably haven’t heard of this. But this compound is all sorts of scientifically interesting, given that it’s been shown to inhibit tumor growth, as well as activate an enzyme that prevents the oxidation of free radicals. What this means for you? Less wrinkles and healthier skin. Beta-carotene, folate, iron and we could keep doing this all day. For a long list of parsley’s health benefits and main components, check out WHFoods. 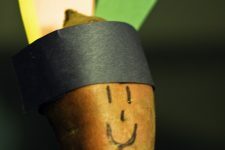 Mainly what we’re concentrating on here is parsley’s innate ability to balance out the skin. It helps regulate sebaceous glands, which means less oil. It lightens skin tones in areas where you may be a little red. And it is an awesome wrinkle-preventer and smoother. To the parsley, we’re going to add the mighty antioxidant and psyche-calming power of cocoa (which also moisturizes and reduces signs of aging), as well as sour cream, for its lactic acid, its friendliness with ALL skin types, and for moisture. 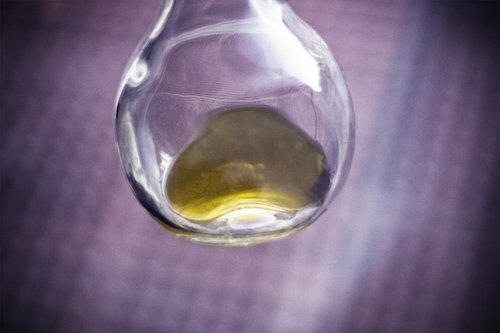 To top it off, we’re also going to use olive oil – one of the oldest beauty secrets in the book. You’re going to do two things at once, as you prepare this. It will be super easy, though, so don’t stress. As you’re preparing the parsley for the mask, you’re also going to infuse some olive oil with it. This all happens at the same time. 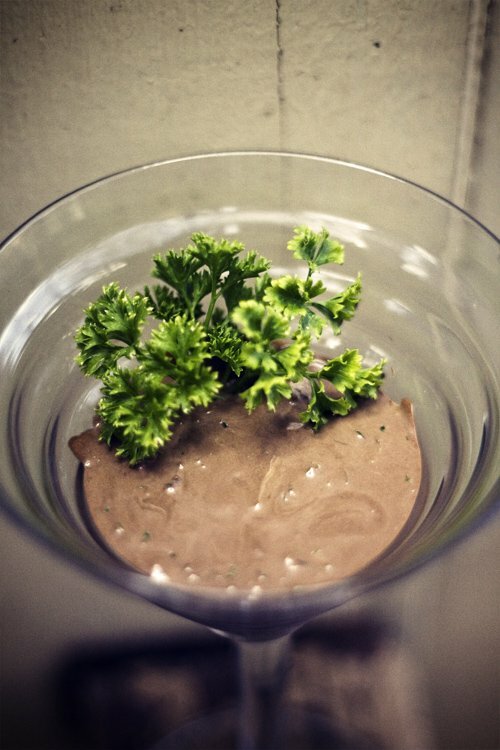 Parsley, sour cream, cocoa powder, olive oil - everything you need for a beautiful face today. 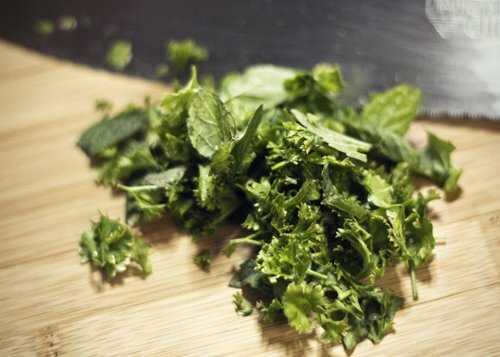 You may notice that there are a few bits of peppermint in my parsley mix. Ignore those. I had a hankering for cocoa-mint, but I really don’t think it added all THAT much benefit to the mask, so I’m not even going to talk about it. So, the first thing you want to do is take approximately 1/8 c. of parsley and rinse it well. Then, chop it coarsely (maybe 5 or 6 times), just to open up the leaves a bit. Once you’ve chopped up your clean parsley, put it in a very small pot and place the pot on the stove. Now, grab your olive oil and measure out about 3 Tbsp. Pour the oil over the parsley and turn the burner to very, very low. It’s important that you don’t overheat the oil, because we don’t want to damage any of the great properties in the parsley. All we’re doing here is helping some of the beneficial stuff eke out into the oil, as well as release itself out of the parsley (which will make it more available to your skin while you’re doing the mask). VERY low heat, people. Very low. Let this go for 10 minutes, stirring and mushing occasionally. 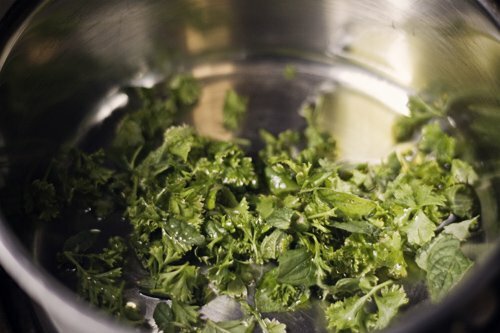 Now, find a small bowl and a fine-mesh sieve and strain the oil from the parsley into the small bowl. You should have a sieve full of green goopy stuff and a bowl full of beautiful parsley-scented olive oil. You’re done with the oil for now, so set it aside. This is a really weird picture of my parsley-infused oil. Happens when you're in a rush. At this point, you still have a goop of parsley in your sieve, right? 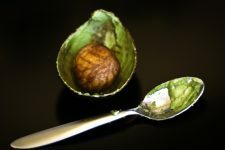 Put it in a small food processor, blender, or bowl (and plan on using an infusion blender if it’s in a bowl). To that, add 2 tsp. cocoa powder and 1 Tbsp sour cream. Let your processor/blender do its thing for a few minutes. No matter what, I couldn’t get the parsley to blend into a paste completely, but that’s okay. That’s what the olive oil and low-heat were there for. It helps pull out the good stuff, which makes it easier to blend in. You may need to scrape down and reblend a time or two. Looks good enough to eat; but don't. Food goes on your face. Slather it on a clean face. Let it sit there for 20 minutes. Rinse off with warm water. Then splash with cool water. After that, finish with a light coating of your parsley-infused olive oil. Rinse off parsley and cut coarsely with a knife. Place the parsley and olive oil in a small pot and heat on VERY LOW for 10 minutes or so. Strain the oil into a small bowl and set aside. 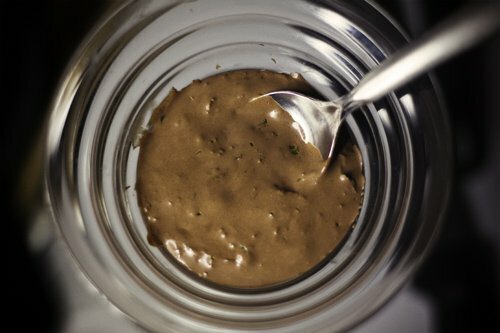 In a small food processor or blender, add “cooked” parsley, cocoa powder, and sour cream. Blend well. Apply to a clean face and neck and leave on for 20 minutes. Rinse well with warm water, and then splash with cool water. Finish with a light coating of parsley-infused olive oil as a moisturizer. The mask makes 1 application and should be used immediately. The oil will last several months (and makes several applications). Just don’t forget to place the oil in a glass container with a top on it. Okay, I know this post is already hugely long, but I have to share the hilarity that happened while I was waiting for this mask to dry. So, I’m lounging romantically on the couch wearing a long velvet robe goofing around taking pictures of my crazy face while wearing a cocoa-stained T-shirt, when there’s a knock at my door. Did he run away? No. Did he scream and hit me? No. He didn’t even look away in embarrassment! LOOK! YOU HAVE FOOD ON YOUR FACE! He can be my neighbor all the time, I think. I mean, he’s really nice. PS. Parsley essential oil is a fave for helping reduce the appearance of tiny broken blood vessels in the face, so you’ll probably get some action there too with this mask. Hahahah me too! Now I’ll be singing that phrase and inserting my own veg alternatives all day long! I have a lot of redness going on so I’ll be trying this mask out very soon,thanks! I got my summer scrub today. I’m so excited to start using it! “Blending portal”… I love it! So sci-fi! Would this work with any kind of parsley? I’m thinking the Italian flat leaf kind? I need to plant some so I can make this mask all the time. Darn! Hubby used the last of the parsley for his pesto. But it was real good! I’ll have to try this the next time he has a bunch growing. Love the picture!! I loved this post! 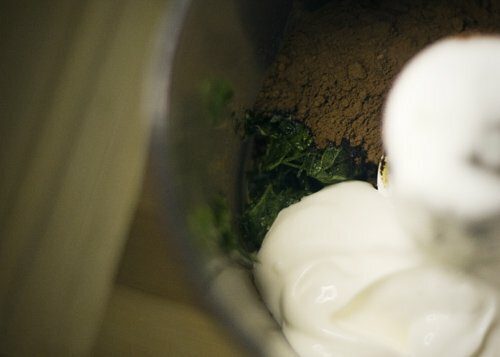 I was actually thinking about trying to create a parsley-based facial mask about a month ago, but never got around to it – now I’ll have to try yours. 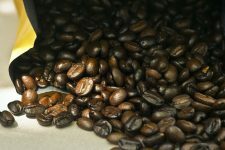 Though I have some pretty high-power blenders around – and a juicer – so I don’t think I’ll heat up the parsley in the oil beforehand – just blend it or juice it and mix it with the cocoa and sour cream. Meanwhile – if you have extra parsley left over, from ANYTHING – use it in fruit smoothies! It adds a lovely fresh grassy flavor, and it’s so loaded with vitamins and minerals that it’s a great addition, health-wise. I’ve got a few recipes (that I use ALL THE TIME) on my website. oh sorry i meant when adding it to the oil…. if that makes a difference? Fear not! You can keep fresh parsley for quite a long time actually. All you need to do is put it in a glass of water like you would with flowers in a vase, and loosely cover the leaves w damp paper towels (which you should secure around the glass with a rubber band) and then place the bag it came in over the top. My best friend is an executive chef and he can keep parsley for WEEKS like this without any of it ever going bad! Just make sure you change the water once a week or so. Also, I wanted to comment on your article about cuts, burns, and scrapes, but couldn’t so I’ll just put it here- Neroli essential oil is AMAZING for helping to reduce the appearance of scars, and whenever I get a cut or anything that might leave a mark I dab some on it a few times a day as Neroli has been shown to stimulate cell re-growth. It is also anti-bacterial, anti-parasitic and anti-spasmodic, and in addition to making a wonderful substitute for neosporin, it can be used to aid in digestive and menstrual upsets as well. Next to Lavender oil, Neroli is my second MUST HAVE essential oil. and btw, with ylang-ylang and sweet orange being two of your favorites, neroli should be right up your alley because it’s derived from the bitter orange blossom. I’m dying to try out this mask, but I’ve got acne-prone skin and I’m not sure about using olive oil. Would jojoba, argan or grapeseed oil make an all right substitute? Has anyone tried this?